From the beginning of 2006, I decided not to renew my television licence. I found that my television viewing consisted almost entirely of tapes of old programmes purchased off Ebay, and that my watching of broadcast television was less than an hour a week. I therefore decided to stop watching broadcast television, and I now spend the £150.50 saved from the TV licence fee on video tapes and DVDs. It is a good decision; I now pay for what I watch, and not for what I don't watch. 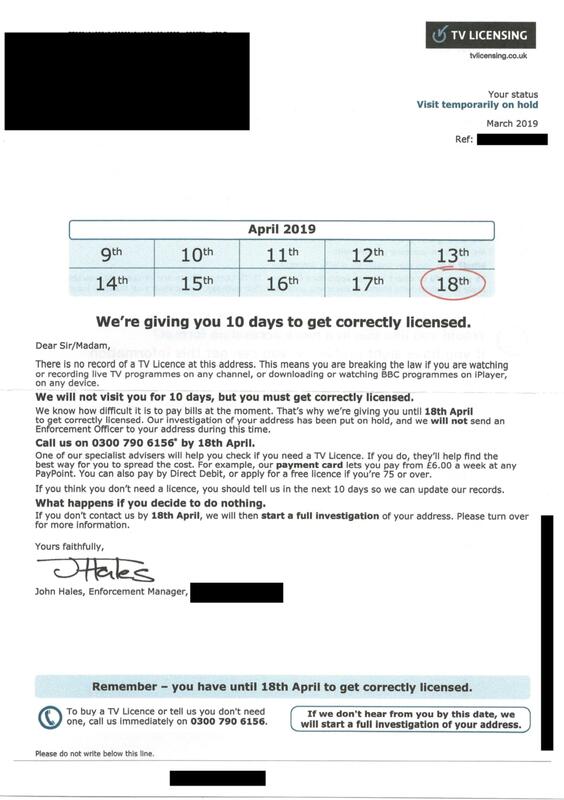 The only fly in the ointment has been aggressive letters from TV Licensing (TVL), which collects the licence fee on behalf of the BBC. 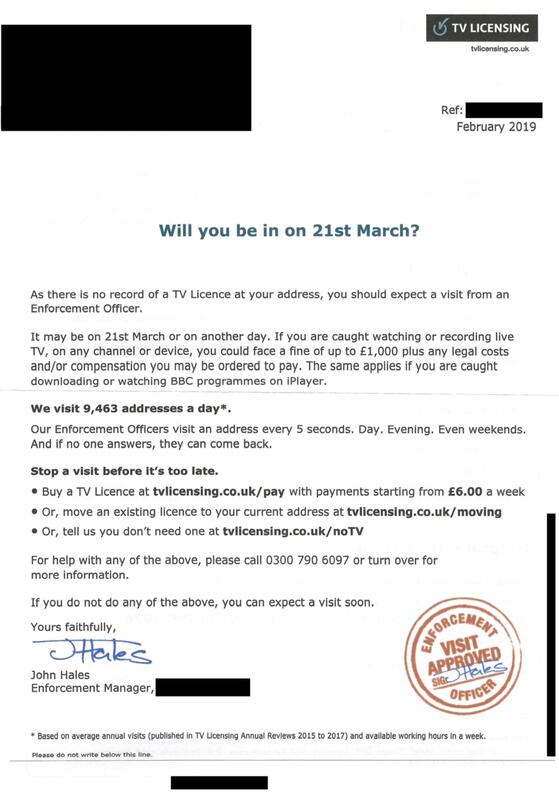 TVL/BBC sends millions of letters every year to people who do not watch broadcast television, demanding payment. 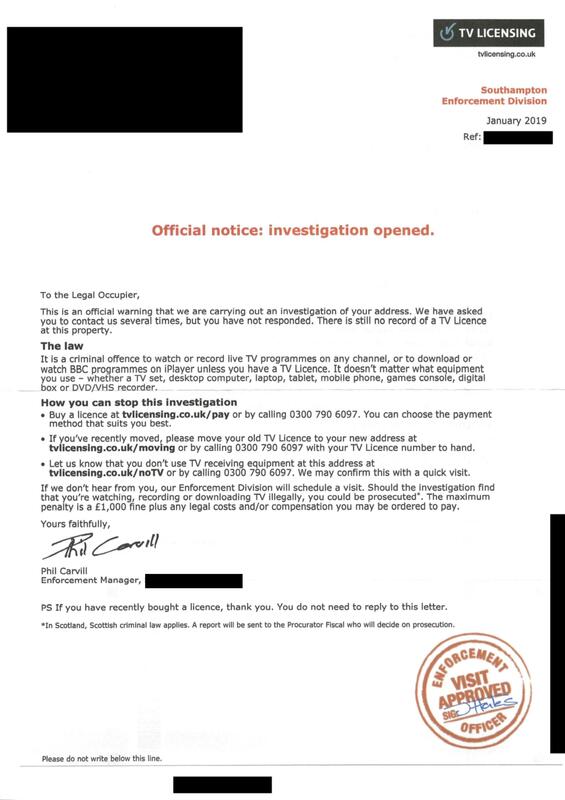 For many people, these letters can be very frightening. But the letters are a bluff; they are computer-generated. TVL/BBC have none of the powers their letters imply and, with a little knowledge, people can stand up to the bullies. The purpose of this website is to share my TVL/BBC letters as I receive them, and to provide useful information for people who have no time for the BBC. Click to view letters from 2006, 2007, 2008, 2009, 2010, 2011, 2012, 2013, 2014, 2015, 2016, 2017, and 2018. Stay on this page for letters in 2019. This is my fourteenth year as someone who does not pay the BBC. I have saved £1,990 and, assuming 50p a letter, cost the BBC a further £69 in postage. White 9 by 6 envelope, with window.